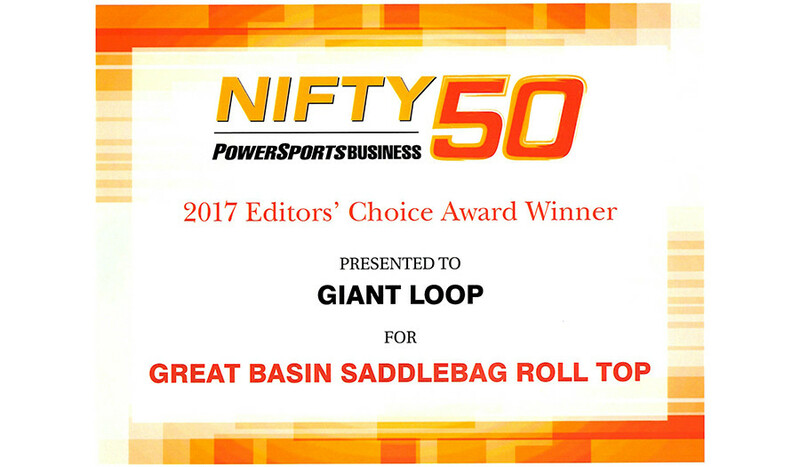 NEW 2017 GREAT BASIN SADDLEBAG ROLL TOP IS HERE! SAME PRICE: USA MSRP $450 WITH ALL INCLUDED COMPONENTS (set of 3 waterproof inner liner Saddlebag Dry Pods with air purge valves, Hot Springs Heat Shield kit)! 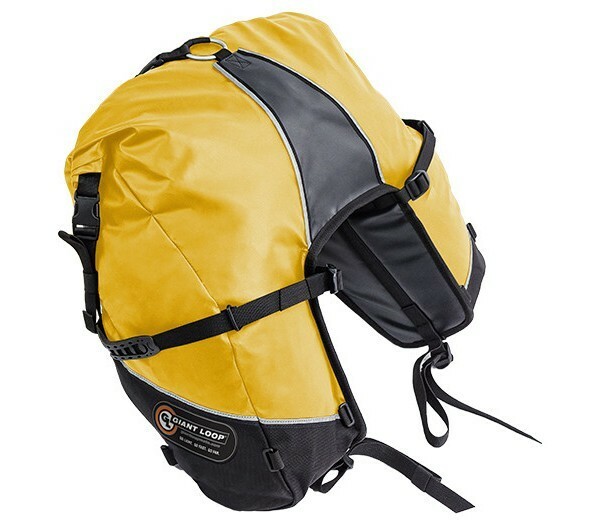 HIGHLIGHTS: More packable volume (68 liters with three full rolls to seal top), convenient roll-top closure, custom Giant Loop branded grab handles/compression straps, updated graphics, lock cable pass-through, lash loops for adding waterproof Possibles Pouches to back, side or front of Saddlebag legs — no additional racks, mounts or braces required! UNIVERSAL FIT: Carry your gear where the passenger would sit on your motorcycle – the remarkably versatile Great Basin Saddlebag Roll Top fits virtually any motorcycle designed to carry a passenger. Anchors to passenger footrest brackets and mounts on pillion seat of sport and sport touring bikes, standards, scramblers, nakeds and adventure touring and dual sport motorcycles. NEW 2017! Introducing the Great Basin Saddlebag Roll Top, a fresh update of the original biomorphic, horseshoe-shaped Saddlebag design that Giant Loop pioneered in 2009. The Great Basin Saddlebag Roll Top features a convenient rolling closure that seals out water and dust while maintaining all the unique “go light, go fast, go far” features of our zipper closure Great Basin Saddlebag. Cable lock pass-though to secure bag to bike while parked. Optional: QuickLoop Cables + OnGuard Padlock available here.